Manhattan’s Restaurant and Bar in Pattaya, is one of Thailand’s top steak and seafood restaurants for fine dining and relaxing. It is also a great wine bar. 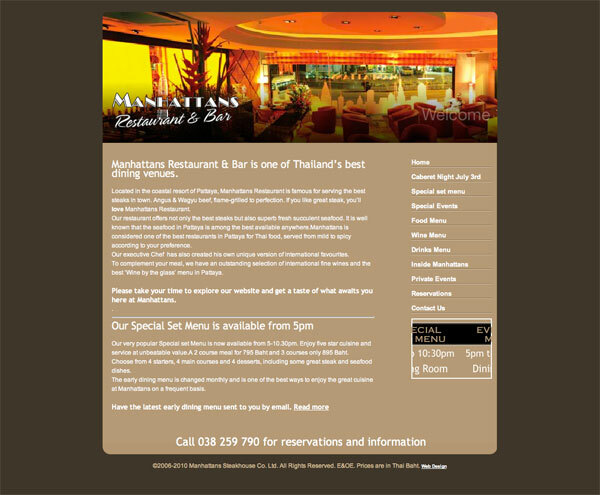 Located in the coastal resort of Pattaya, Manhattans Restaurant is famous for serving the best steaks in town. Angus and Wagyu beef, flame-grilled to perfection. If you like great steak, you’ll love Manhattan’s Restaurant. Our restaurant offers not only the best steaks but also superb fresh succulent seafood. It is well known that the seafood in Pattaya is among the best available anywhere.Manhattans is considered one of the best restaurants in Pattaya for Thai food, served from mild to spicy according to your preference. Our executive Chef has also created his own unique version of international favorites. To complement your meal, we have an outstanding selection of international fine wines and the best Wine by the glass menu in Pattaya. Not surprised. I thought it sucked!! This sub- forum needs updating at least annually. Well the only way you can expect things to get updated is to send a message if you know something has gone out of business. Otherwise it is impossible for anyone to keep up with failed businesses all over the country. And in fact it has now been updated because of your post which is the only logical way for these updates to happen.